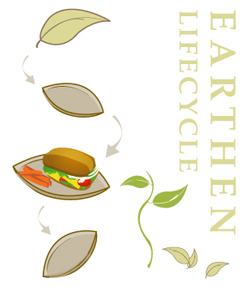 Earthen offers easy and convenient Biodegradable Dinnerware and tableware solutions at affordable prices. Hard and Sturdy: Feels almost like thin layer of wood. Great with hot food: Makes it easy to serve and handle hot dishes. Great with liquids. You can use them for soups, curries, chilies, and so on…. Re-usable: May be re-used for dry dishes. Can withstand a wet wipe.